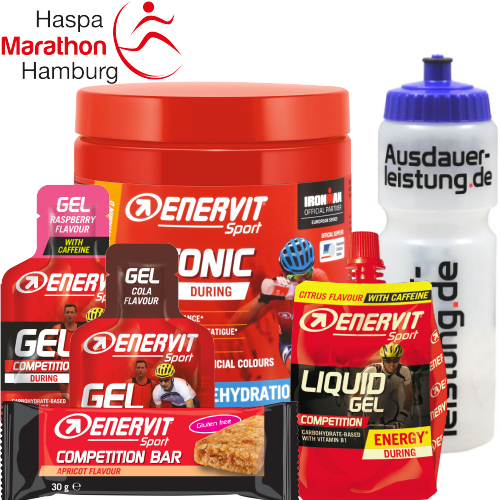 ENERVIT is the new official nutrition partner of the Haspa Marathon Hamburg and will provide you with more energy on the course and around your run on Sunday, April 28th through Enervit sport isotonic drinks, enervit sport gels and Enervit sport competition bars. The Italian company shows more than 40 years of research experience in endurance sports and sports nutrition. The focus is on the individual needs of athletes, both in training and in competition. A team of scientists and nutrition experts is constantly working to create innovations and improvements for the sports nutrition market. Six months before the 34th edition of Germanys biggest spring Marathon all start slots for the halfmarathon- and the relay competition are sold out. At the marathon competition 6,000 slots are issued. The third price level is reached thereby. The start slot here costs 80,- Euro. Become a part of this extraordinary running event through the city of Hamburg. We are looking forward to welcome you! So register now and create your personal training depot while there´s yet sunny golden autumn. Germany’s biggest spring marathon will have 361° as its new official sports brand partner. The company is one of the biggest Chinese sporting goods manufacturers and this partnership continues the expansion of its brand presence in Europe which began in 2016. “The brand 361° is as young as it is aspiring and stands for recognized high-quality and attractive running shoes which regularly receive excellent ratings in surveys undertaken by well-known running magazines compared with established competitor brands. We are delighted to become partners in the successful story of 361° which has only just begun,” said Frank Thaleiser, chief organizer of the Haspa Marathon Hamburg. 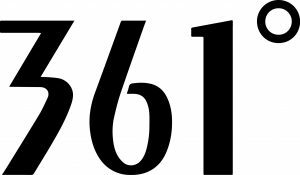 361° is expanding its reach in Europe. The company was founded in 2003 and is one of the biggest sporting goods brands in China. As part of its vision to become a global sports brand, the company has expanded its business in North and South America as well as Asia and, since 2016, in Europe. The focus for initial market penetration is on running footwear. 361° running shoes are equipped with QU!KFOAM which provides a unique running experience; the perfect combination of cushioning and response. A team of international experts has been brought together with the aim of supporting athletes of all levels perform beyond their expectations. 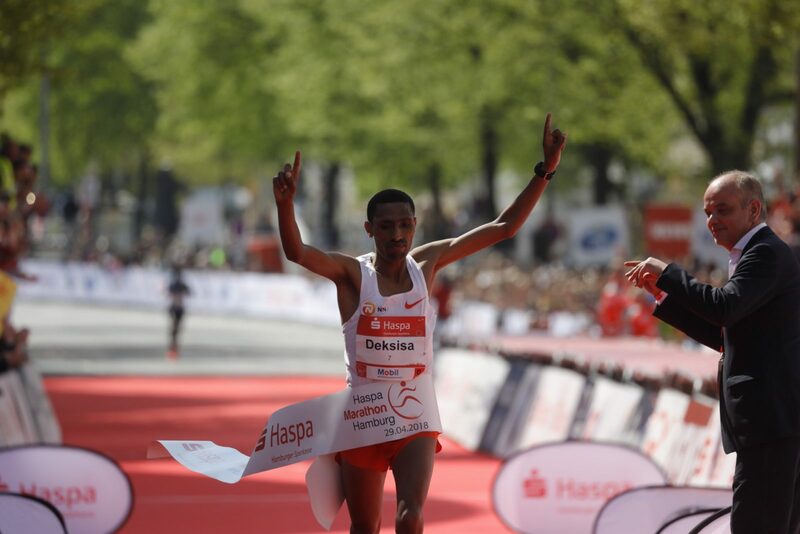 Ethiopians world-class runners dominated the Haspa Marathon Hamburg, taking all three spots on the podium: Solomon Deksisa won with 2:06:34, which is the third fastest time ever run in Hamburg. Debutant Tadu Abate took second with 2:06:54 while Ayele Abshero was third in 2:07:19. Kenya’s Solomon Yego took fourth with 2:07:37 while the marathon Olympic Champion from London 2012, Uganda’s Stephen Kiprotich, was fifth in 2:07:57. Shitaye Eshete of Bahrain took the women’s race with a time of 2:24:51 from Ethiopia’s Birke Debele who clocked 2:25:28. Running a fine debut Mimi Belete, who competes for Bahrain, was third in good weather conditions with 2:26:06. 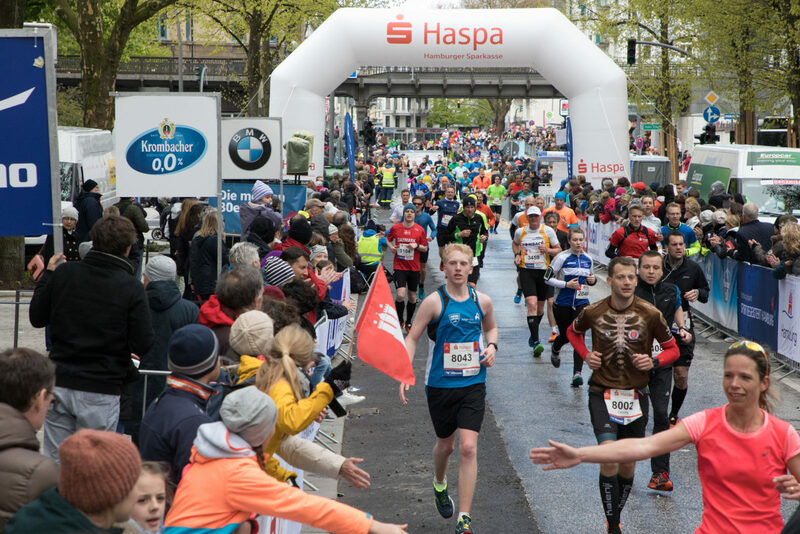 Including events at shorter distances a total of 33,183 entries were registered for the 33rd edition of the Haspa Marathon Hamburg. 14,250 of them ran the classic distance in Germany’s biggest spring marathon. Emmanuel Mutai hopes he will return to running fast again when he competes in the Haspa Marathon Hamburg on Sunday. The Kenyan is the fourth fastest marathon runner ever with a personal best of 2:03:13. In what is probably the strongest men’s elite field ever assembled in the history of Germany’s biggest spring marathon five men feature personal bests of sub 2:06. The field includes the Olympic Champion from London 2012, Stephen Kiprotich. However there are half a dozen runners in the race with faster personal bests than the Ugandan. The strong line-up increases hopes that the five year-old course record may be broken. Kenya’s superstar Eliud Kipchoge established this mark in 2013, when he won his debut marathon in 2:05:30. Current weather forecasts seem to be suitable for fast times, however conditions can change quickly near Germany’s North Sea coast. Sweden’s Isabellah Andersson heads the women’s field with a personal best of 2:23:41. Organisers of the Haspa Marathon Hamburg registered a total of 33,183 entries including events at shorter distances. 14,250 runners will compete in the marathon. The pace is planned accordingly. The first group is scheduled to run split times leading to a 2:05 finish. There will be a second group targeting a 2:08 time. It will be interesting to see who will join which group. Asked which one he will go with Stephen Kiprotich answered: „If the weather conditions are fine I will go with the 2:05 pace. Then it will be my goal to improve my personal best.“ The Olympic Champion from 2012 and World Champion from 2013 so far has a PB of 2:06:33. „If all of us work together from the first kilometre up to may be 38 or even 40 k then it is possible to break the record,“ said Stephen Chebogut, who has already run 2:05:52 in 2015. Earlier in that year he was third in Hamburg with 2:08:01 although he was entered as a pacemaker and then decided to carry on. „May be I am able to deliver another surprise on Sunday,“ said Chebogut. While former Kenyan Isabellah Andersson is the fastest woman on the start list the Swede has no intention to attack her personal best of 2:23:41. „It will be my first marathon after giving birth to my second child. My aim is to achieve the qualifying mark of 2:38:00 for the European Championships“, said Andersson, who trained in Eldoret in Kenya during the past four months. It is highly unlikely that the course record of 2:21:54 established by Ethiopia’s Meselech Melkamu two years ago will be under threat on Sunday. Organisers plan for a conservative 2:27 or 2:28 pace and expect a close contest. There may well be half a dozen runners in contention for victory with such a pace. Among them should be Sylvia Kibet of Kenya and Bahrain’s Mimi Belete, the former 1,500 m runner. 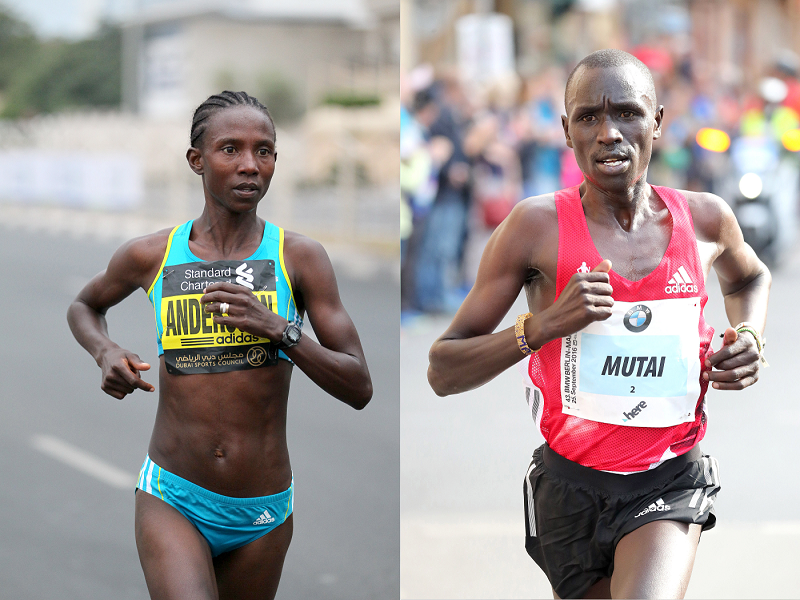 Kibet was second in Hamburg in 2015 with 2:26:16 while Belete will run her debut on the fast course. She ran a 69:26 half marathon earlier this year in Barcelona. 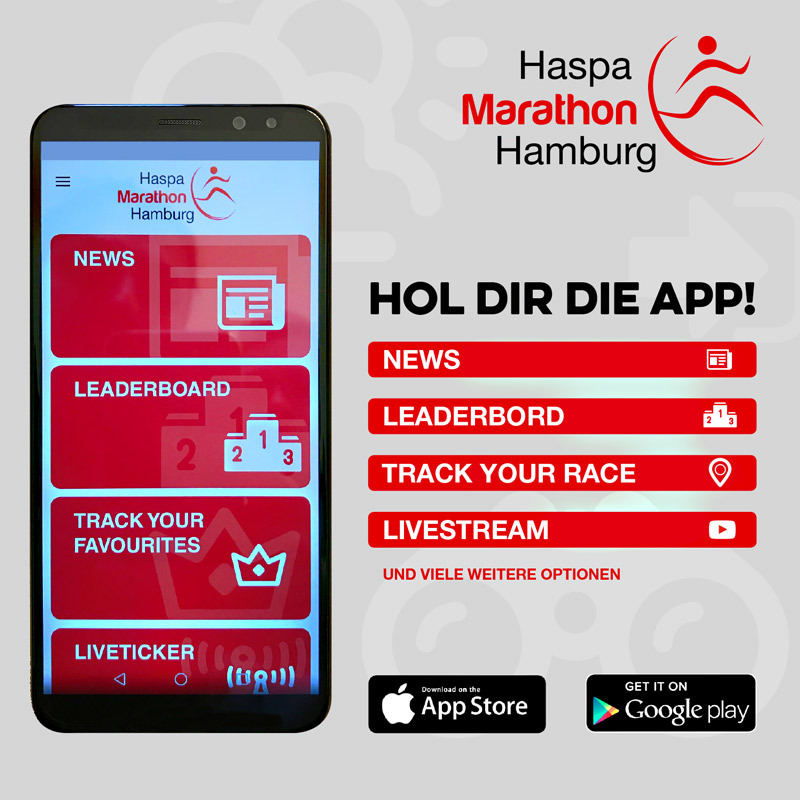 You can now get the official Haspa Marathon Hamburg app for your smartphone. The app is FREE and available on the Google Play Store and the Apple App Store. Participants can view and share their position live via GPS during the race with the “Track My Race” function. – Track My Favorites: participants can mark and follow their personal positions live during the race. – Live ticker: by this button you can instantly call up the real-time commented race. – The leaderboard lists all participants at the time measurement points as they pass through and provides projections of the expected finish time. – Spectator information: Here you can find important information on the topics travel, hotspots along the route, route map and meeting points after the race. – The Facebook, Instagram and Twitter buttons lead to the social media profiles of the Haspa Marathon Hamburg. – The Social Wall collects all #HamburgMarathon posts by participants or viewers on event profiles on Facebook, Instagram or Twitter. 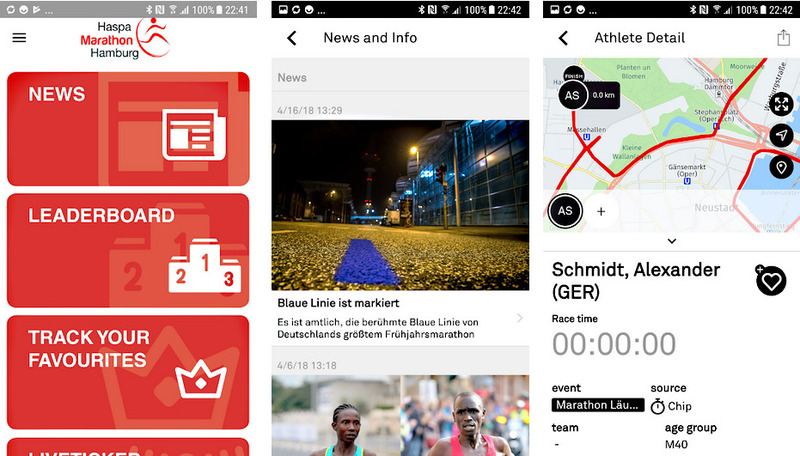 Die Marathon Hamburg App ist imm Google Play Store und im Apple App Store erhältlich. 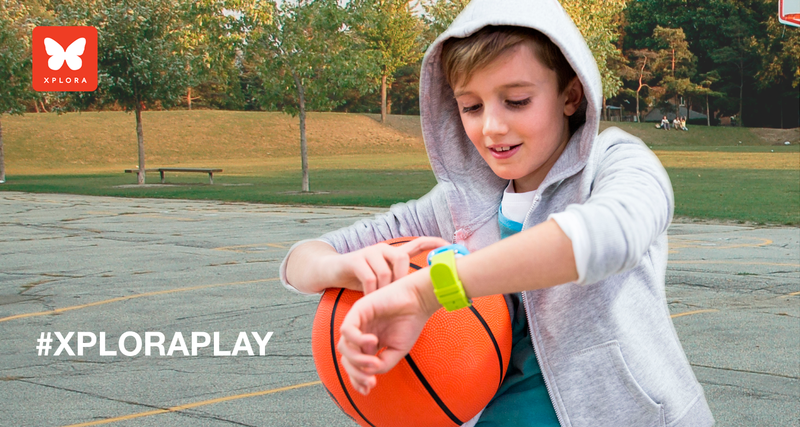 XPLORA KIDS Smartwatch was founded with a clear vision: To connect families while allowing children to develop freely and explore the world on their own. XPLORA is the first smartwatch of its kind, approved by the federal network agency. It`s a mobile phone for kids, only with safe and relevant features. Internet, social media and inappropriate apps have been consciously removed. Parents can call and locate their kids if needed. 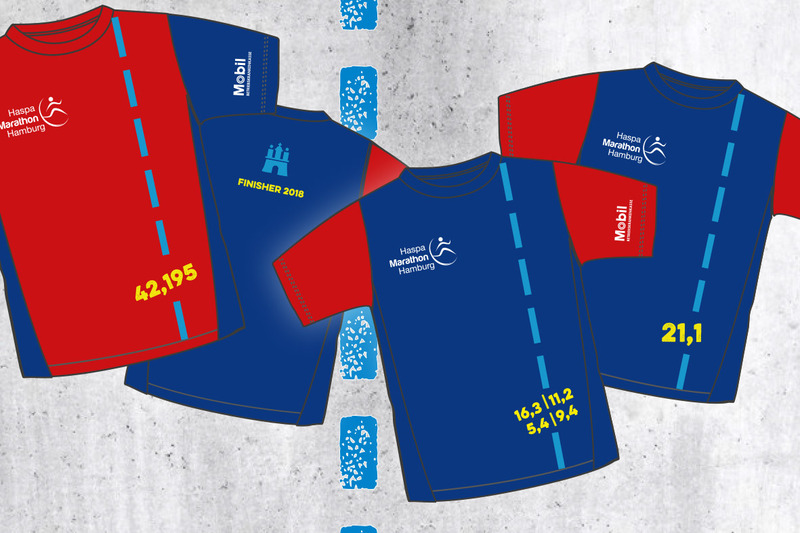 The design of the finisher shirts for all three competitions of this year’s Haspa Marathon Hamburg – Marathon, Half Marathon and Relay – is now confirmed. Already registered participants, who had not yet ordered a finisher shirt when having registered and would now like to make up for it, please send us a short message via the contact form stating your booking number and the desired size. New applicants can conveniently order the finisher shirt when registering. The shirts will be distributed as part OF the starting documents on Friday, 27. and Saturday, 28. April. The 2018 marathon season is coming! Read why the Haspa Marathon Hamburg should be on your list. Winter is coming, temperatures are dropping, it’s chilly and dark outside – this can affect your mood and motivation to run. It may be helpful to set a clear and specific goal now. Something, that you could look forward to, like the 33rd Haspa Marathon Hamburg on 29. April 2018. 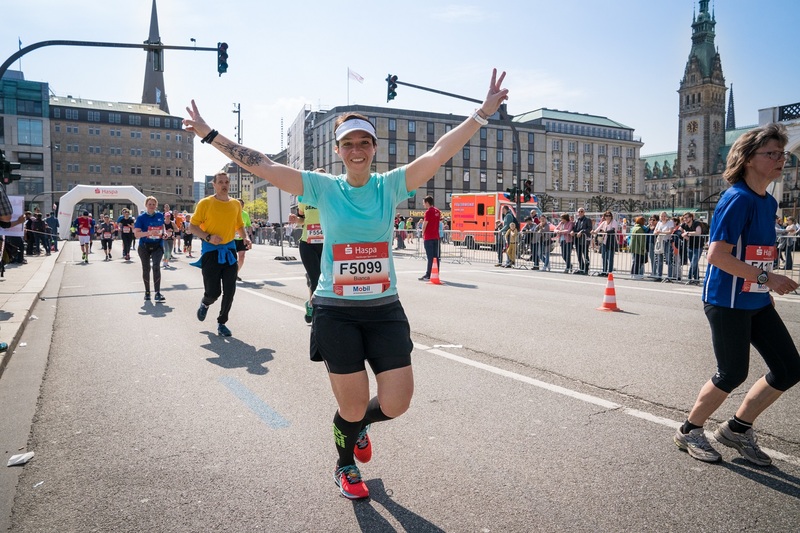 What is the Haspa Marathon Hamburg like? 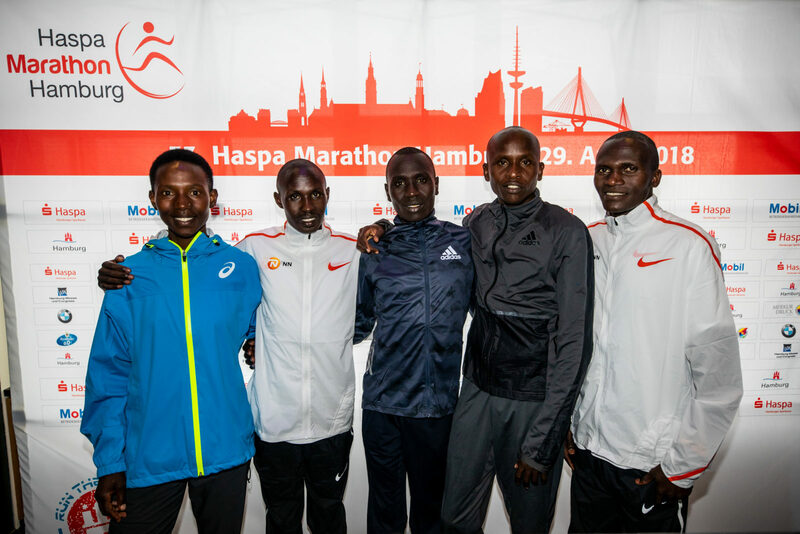 The Haspa Marathon Hamburg is one of the most watched and fastest marathon races world-wide. The course record is set at 2:05:30 and is helf by Olympic Champion 2016 Eliud Kipchoge. He set the time in 2013, when he still was a little known distance runner. Hamburg was his marathon debut. 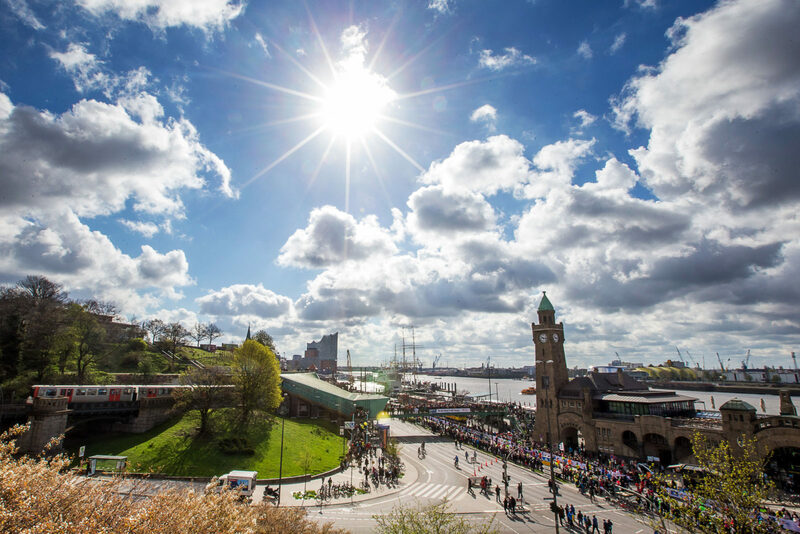 The Haspa Marathon is the oldest popular sporting event in Hamburg and Germany’s largest spring marathon. The course is a out-and-back sightseeing tour of the beautiful hanseatic city. The marathon in Hamburg is also known for the one-of-a-kind crowd support. People cheer you on all along the route and make the race a very special experience. Why #RunTheBlueLine? The blue course line is painted on the roads every year in April to show the marathon runners the fastest way from start to finish. Hamburg was the first German marathon to start this tradition in 1986. Follow and run the blue line and you can’t get lost for sure! More race info go here. For the first time we have set the entry limit to 16.000 runners. So don’t wait too long and sign up now to take part in the 2018 marathon! With a clear goal to look ahead, training can be so much more fun.